Great for mid-spec gaming builds, this mobo is on offer at Amazon until midnight Pacific time. If you're looking to start a new gaming build, an eminently sensible place to begin is with a quality motherboard. While the newer Z390 boards are undoubtedly the best in the business, and essential for high-end gaming PC builds, the Z370 models are still enormously easy to recommend and purchase with confidence, especially if budget is a concern. 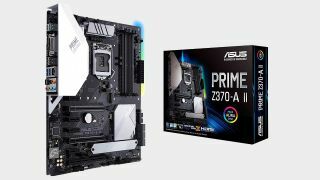 Today, and for today only, Amazon is offering the ASUS Prime Z370-A II mobo for $112, which is a respectable 36 percent less than the normal selling price, pushing this board well below its cheapest ever price. It comes with dual M.2 slots, is compatible with 8th and 9th gen processors, is pretty handy for overclocking (a great option for mid-range gaming PC builds), and it has fancy RGB lighting for a splash of flair and color. If you're looking at the best gaming motherboards, you'll easily spend upwards of $200 on a newer Z390, which is necessary for i9 CPUs for sure, and will future-proof you for a hell of a long time. But the ASUS Prime Z370 is half that price, and still offers decent wireless, good overclocking potential, and those all important M.2 slots for newer SSDs. The closest comparison to this is actually the ASUS TUF H370 Pro Gaming, which is currently $270 at NewEgg, making this motherboard look like quite a bargain. However, it's very important to remember that the Z370 won't support AMD builds. If you're a seasoned PC builder, you already know what YOU need from a mobo, so it all ultimately comes down to what other parts you want to include. For our money, this ASUS motherboard is a good one for the price, so if you fancy it, you'll need to snap it up today, before midnight Pacific.